As many of you may not know, but we have begun an exciting time at HHH. For 15 years our mission has been to care for orphans. That includes more than just providing room and board to children. They have been attending school and church and have had the opportunities to learn different life skills along the way. We are now transitioning a few into adulthood! Our oldest two kids are now off starting their time as young adults. Wisly & Madline, are off to great start! Wisly is studying pre-med at College of the Ozarks in Southern Missouri and Madline works for HHH caring for the toddlers and assists Project Hope on a part time basis. 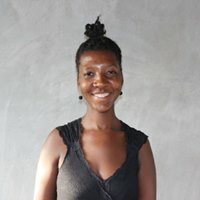 She has purchased her own land in Pignon and is planning the construction of her own home. Remembering where these two started when they came to HHH – it is amazing to see God’s hand in their lives and we are constantly praying for their success. 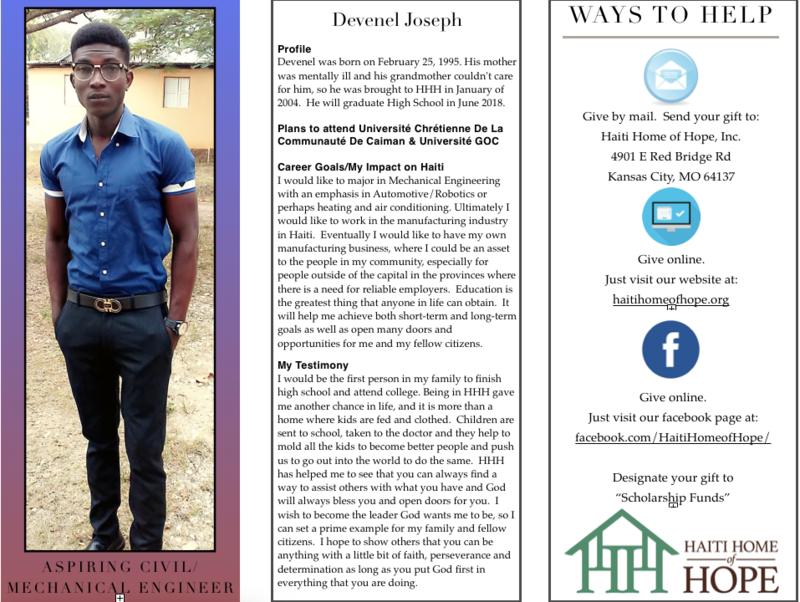 The next young adult that is set to graduate from HHH is Devenel Joseph this June! Attached is a flyer that Devenel helped to create. (Devenel Joseph Scholarship) He goes into detail about his career goals and how thankful he is that HHH was a part of his upbringing. 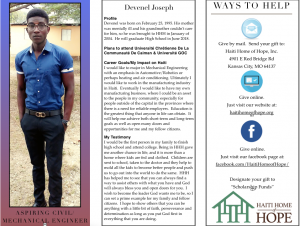 Our mission is to help find caring individuals that want to be a part of his next chapter in life and sponsor him to go to College in Haiti. We previously posted about UCI and our desire to send our kids here for higher education. The cost to attend University in Haiti is about $2,250/year including room and board. Over the next 15 years we have kids graduating, all with their own unique dreams and goals. Make sure to designate your gift to “Scholarship Funds”. If you have questions Heidi and I would be happy to talk with you – we are excited to be a part of this exciting time at HHH! Plans are underway for our next visit to HHH! We are excited for this trip because it marks our first trip serving as Directors of Education. We are laying some groundwork for our ministry duties once we are in country permanently. 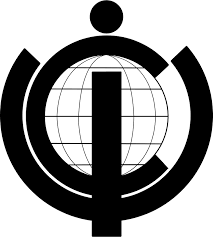 We plan to take Devenel on a university visit to UCI (United Christians International) or in Kreyol (Université Chrétienne de la Communauté de Caîman). 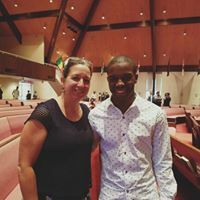 He will be our first student that has the opportunity to attend university in Haiti! Pray with us that he gains clarity in his long-term goals through this process. We are proud of his commitment to finishing high school and exploring options that will allow him to be a leader in his community in the future. At UCI we will meet with the missionary family that runs this ministry. We will discuss educational options for our students, tuition costs, and career placement. We will be assessing the kids at HHH that are unable to attend traditional Haitian schools. Our goal is to determine the best plan of action to prepare them for an independent life after their time with us. This may include on-site education, but will definitely include vocational training. We pray that they will be a positive influence on their community as well. There is always so much preparation that goes into a trip to Haiti. So many things to remember! Our plans also include some video work! Stay tuned next week for an announcement….involving baseball….! !